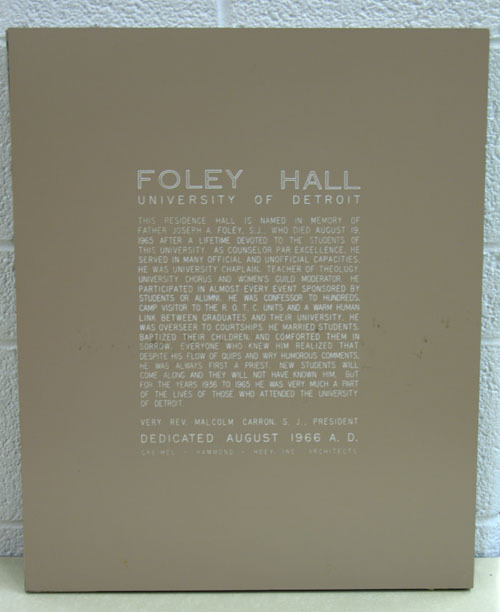 A couple of weeks ago, David Baxter, Ph.D., a former student of U of D sent me an email asking if the archives would like the dedication plaque from Foley Hall that he had salvaged from the junk pile when the building was gutted for renovation back in 1976. He had kept it all these years in his office at Walsh University where he served in various teaching and administrative positions. He had retired and thought we would like to have it for the university archives. I could not say “YES!” fast enough! 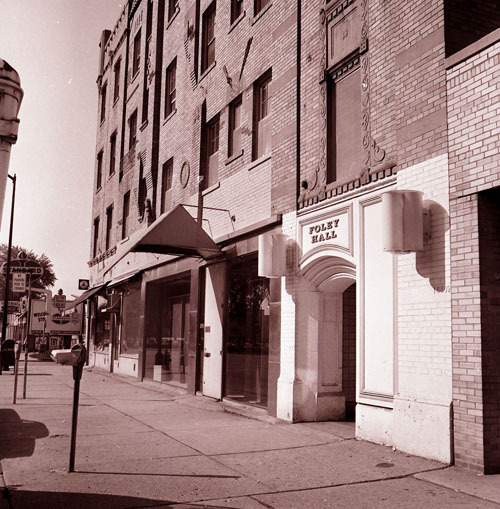 Foley Hall was not on the main McNichols campus, but was located just north of Florence on Livernois. 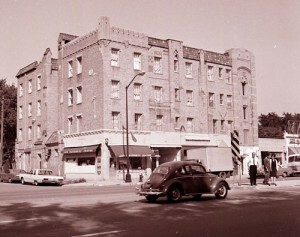 The building used to be the Palmer Hotel and was initially purchased for the purpose of being the women’s dorm. The rooms, however were too small to accommodate two women and eventually it was used to house a restaurant on the lower level and faculty offices for the English Department. It finally got in such bad condition it was condemned and torn down in 1985. 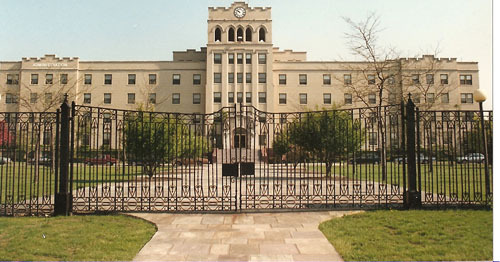 Dinan Hall: Built in 1915, located on E. Jefferson Ave. At various times it housed the College of Engineering, Law and Dentistry. It had to be torn down in 1963 to make room for a ramp leading to the Chrysler Expressway. UD Stadium (Dinan Field): Ground was broken on June 1922. It had a seating capacity of 20,000. In September 27, 1929, the University of Detroit opened its football season against De Paul University in what was the first game to be played in Detroit under artificial lighting. The football program ended in 1964, not long after, the stadium was torn down during the summer of 1971. Administration Building, Mercy College of Detroit: The first and central structure on the Mercy College campus the Administration Building, completed just in time for the beginning of classes in Fall 1941. 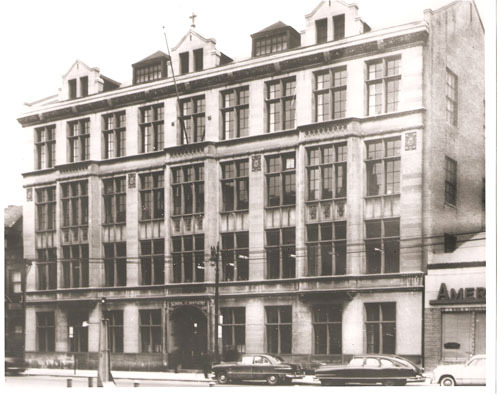 Besides administrative offices it also had classrooms and the campus chapel. Not long after the campus was sold to become the Northwest Campus of Wayne County Community College in 2007, the building was torn down. The stained glass windows of the chapel were relocated and can still be seen in the College of Health Professions building on the McNichols campus. Just as a final note: on the corner of Livernois and McNichols, there was a building where the streetcar would make a turn-around. 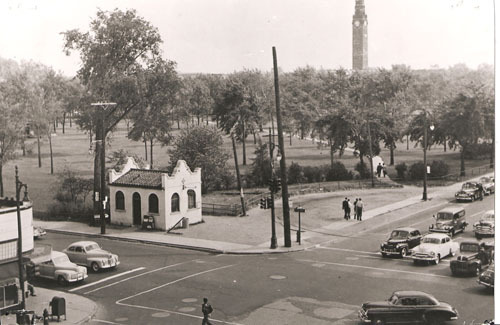 Perhaps as a sign-of-the-times, the little building is long gone, but if you have an electric vehicle there are a couple of charging stations on campus that you can use to charge up your electric car. While buildings may come and go (a new Students Fitness Center has been built and Dental School has a new location on Martin Luther King Jr. Blvd), the memories will linger on.